The Week is a new meme for Gemrene. I doubt I’ll write up a recap every week, but when I do, it’s a nice way for me to collect my thoughts and summarize the notes I have written each day in my planner. Enjoy! Last Weekend – I traveled to Chicago alone (though I met my mom at the hotel) to tour colleges. We attended the Notre Dame game, where the Chicago Blackhawks made a surprise appearance – and sat just a few rows away from us. Monday – An incredibly overwhelming day in every capacity, but I had a good conversation with my trainer about colleges. Tuesday – I felt nauseous in the morning, so I signed out of school at the end of first period. This turned out to be a good decision, because I got a ton of work done during school hours. 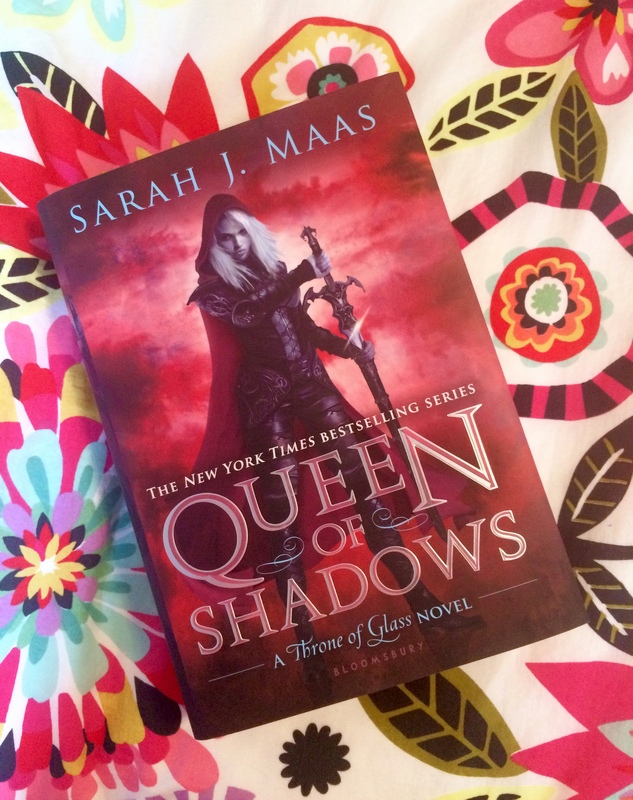 I also finished Queen of Shadows by Sarah J. Maas. #truelove. So. Many. Feelings. To add to my emotional intensity, One Direction announced the preorder for their new album, Made in the A.M., which releases November 14. AND, they dropped a beautiful song called Infinity. After all of that drama, I attended the first Lightning pre-season game and watched my brother do the Thunder Skate for the gazillionth time. We lost, but it was fun to get back into the hockey swing. Wednesday – The first day of autumn came and went without my realizing it, despite having decorated the day with orange highlighter in my planner. I drove to Barnes & Noble after swim practice, hoping to pick up a book and work on college essays. Unfortunately, both plans were foiled by an insufficient stock of YA books and a low laptop battery. I succumbed and order the book from Amazon and came home to make some progress in the very early stages of my essay. Thursday – My swim team competed against our biggest rival in the most anticipated dual meet of the season. I didn’t swim my normal events and didn’t do as well as I’d have liked to, but I did anchor the last relay and seal our victory (we won by a wide margin though, so that’s not saying much). I returned home, ate bagel bites for dinner, and then by complete chance stumbled across a few vegan and animal cruelty videos on YouTube. Within an hour or two, I had decided to make the switch. Friday – Another hectic day with Gold & Black tapping, two tests, and a quiz. I had work right after school and then I babysat until around 1 am. My book was promised to arrive by 8 pm, but didn’t. Friday also marked my first day as a vegan. I resisted the gourmet pizza and breadsticks at my babysitting job and cooked myself some pasta instead. WOO HOO. Saturday – I saw Anton Stralman, a Lightning defenseman, eating lunch with his four adorable kids at a local deli restaurant when I picked up lunch for my coworkers. I smiled at them before I even registered who they were and then quickly turned away so as not to bother them or embarrass myself. My book arrived in the morning and I took a trip to the mall to buy my mom some fall candles and myself an autumn lotion from Bath & Body Works. Then, my mom and I met with a few women at Panera to interview for a scholarship. Admittedly, it was fun because I got to talk about myself and my experiences and motives for an hour or so. But I left the meeting feeling like I look like a better person on paper than I am in real life. Later, my family (minus one brother) went to another family’s house to eat dinner and hang with them and yet another family. We’re all big hockey families and it was fun because I got to chat with the adults and observe the rambunctious kids with a small smile. Another big vegan test – resisting pizza, breadsticks, and multiple desserts. I’m proud to say that I passed and stuck to the crackers, guacamole, salsa, and grapes. Sunday – I went shopping for vegan foods for the first time today. I stopped by Trader Joe’s and Fresh Market and picked up an assortment of goods to experiment with this week. I also bought tickets for me and one of my best friends to see Halsey and The Weeknd in December. I plan to spend the rest of the day preparing blog posts, writing college/scholarship essays, and hopefully sneaking in a little reading. Given that for many of us, college applications are a reality and admissions (and rejections) are right around the corner, I decided to pick up and review J.K. Rowling’s famous Harvard commencement speech. While this 80-page book is expensive – $15 in the U.S. – I do think it’s a more enjoyable experience to read Rowling’s speech in book form rather than online in the public domain. 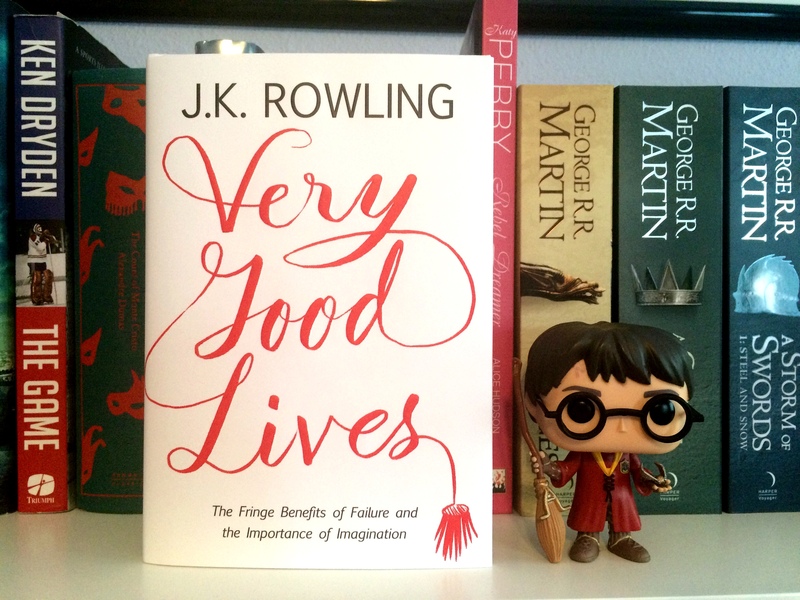 Additionally, the proceeds of this little book go both to Rowling’s Lumos charity for ending the institutionalization of children and to Harvard University’s financial aid program. 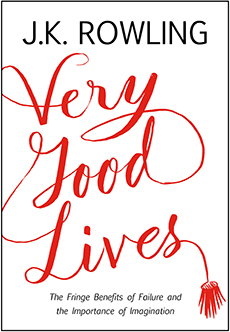 I found that I love J.K. Rowling’s message in Very Good Lives. I didn’t know exactly what to expect going into it, but I thought she had some really good points. Rowling emphasizes the value of doing what you love, but also stresses that those who are fortunate enough to receive an education have “unique status and responsibilities.” Political activism, human rights advocation, and empathy for the powerless are both the privileges and burdens of the powerful, the educated. Rowling also stressed that failure can be good. It sounds crazy in a simple sentence, but her elaborations and personal anecdotes – like how she wrestled with poverty for years as a single mom before Harry Potter took off – really bring this truth to light. Choosing to live in narrow spaces leads to a form of mental agoraphobia, and that brings its own terrors. I think the willfully unimaginative see more monsters. They are often more afraid. What is more, those who choose not empathize enable real monsters. For without ever colluding an act of outright evil ourselves, we collude with it through our own apathy. I most definitely recommend that anyone of any age read this speech because it truly is life-changing. It gave me some much needed perspective on the college admissions process and my not-so-distant future as an adult. 1. Today is my blogoversary. I’ve posted at least once every month in the last year, with the exception of July since I was out of town practically the entire month. 2. I had a breakdown last week. I started freaking out about college apps and where I’m applying and in what order. It’s not logical but it’s strategic – my decision is based on emotion and it scares me. 3. The next morning, I got called down to the principal’s office. I learned that I am a National Merit Semifinalist, one of six at my school. My fears haven’t dissipated, but they have faded from my forethought – for the time being. 4. I’ve been eating so much, too much. My body is barely outrunning it but it will catch up to me in the end. He always gets the last word. 5. People can still surprise me. A football player congratulated me for being a NMSF and struck up a brief but sweet conversation about college and plans and me. It impacted me a lot and has forced me to reevaluate certain stereotypes I have formed based solely on people’s extracurriculars and who they’re friends with. 6. I found out that someone I’ve had a tremendous amount of respect for throughout high school drinks and it’s bothering me. I feel as though I’ve been deceived because she paints herself to be a mature young woman and I don’t think getting wasted at a concert is mature at all. 7. I don’t like grey areas. 8. I feel fall sometimes and I am filled with a longing for the past-present-future, books and sweaters and sips of hot chai, turning leaves, crisp air, and change. 9. There is a certain finality about my senior year in high school that I never anticipated. I don’t plan on living in Tampa after college. This will be the last birthday that I celebrate with my family for a long time. I can’t buy concert tickets for next year because I don’t know where I’ll end up. This will be the last season that I can go to the Lightning’s opening night game. I’m missing the Lightning Fan Fest again this year and it hit me that there is no “next time.” If I don’t go to a high school football game this year, I never will, at least not as a high school student. I’m finding that it’s more important to attend family gatherings that I otherwise might have skipped due to homework and stress. There is no next year. At least not in Tampa. 10. I went to the 5 Seconds of Summer concert with my friend this past weekend and it was so much fun. I was sick (still am) and lost my voice even further by scream-singing along to all the songs. The guys made us laugh and are so talented; they made it very clear that they adore and appreciate their fans. 11. If you’re going to act all high and mighty, judging everyone in the vicinity and placing your morals on a pedestal, you sure as hell better stick to them. It’s a long way to fall. 12. Sarah J. Maas just announced on Twitter that her Throne of Glass series has been optioned for a TV show. I am livid – I have been crossing my fingers and praying to God for years that my favorite ongoing series that contains several of my all-time favorite characters is never adapted to the screen, whether for a movie or a show. The dreaded day has come, and I am dying. I very selfishly hope that the show never makes it into production. This show, whether I watch it or not, will ruin images and characters and world-building that I hold very near to my heart. The screen – and humans other than Sarah J. Maas – cannot possibly do this series justice. Please please please NO. Today I’m here to share a very tiny book haul. As some of you may know, I reorganized my bookshelves recently. Along with a new system that shelves my books alphabetically in height order and separates my unread books from my read ones, I made a code with myself on buying new books. Basically, I will only buy a new book once I’ve read an old one off my TBR shelf. That way, the shelf can’t overflow. This plan has been working in theory. I’ve been disciplined, though I haven’t made much progress with tackling the TBR shelf itself. However, fall is my favorite time for books because there are so many new releases that I spend all year anticipating. So without further ado, here is the first step in my fall from book-buying-ban glory. Like a true addict, I have no regrets. Quidditch Harry Potter Funko Pop! What new books have you gotten recently? 1. Fall is coming. Maybe not weather-wise, at least not here in Florida – it won’t get below 80 until December (we are currently stuck in the 90s.. sigh). But in scents – candles, lotions, food – and music and books and hopefully memories, fall is on its way and I am so excited. 2. Wildest Dreams blew my mind. Taylor Swift is so talented and her team is utterly fantastic. I love love love the story her new video tells in conjunction with the song. Even better, all her proceeds will go to an organization dedicated to protecting African wildlife. And don’t get me started on Scott Eastwood, oh lord. I knew this music video would be a hit with my mom simply because he’s in it. 3. 5SOS’s Jet Black Heart released today and it’s honestly a gem. An onyx gem, but a gem nonetheless. I am obsessed with its dark intensity and that is all I have to say. GO LISTEN. 4. I’ve been inspired by the wonderfulness that is Grace to maybe start keeping a journal again. I’ve done it on and off again in my seventeen years – mostly off – and I worry that I won’t be consistent with it. But my head is a tangle of emotions at the moment and it’s senior year and why not? 5. I re-memorized J.R.R. Tolkien’s The Riddle of Strider, which is one of my favorite poems. I worshiped Aragorn as I grew up watching the films and I’ve decided that once I finish my college apps – or at least my most pressing ones – I will treat myself to a read of The Lord of the Rings (among other books… my “to read after college apps” list is growing steadily but not so slowly). 6. It’s my little sister’s ninth birthday and she is finally older than I was when she was born. She’s going to get her ears pierced soon and I have a list on my phone of advice I’ve collected for her over the past few years. I’ll give it to her when she’s going into middle and high school but I doubt she’ll need it as much as I did do. In many ways, she’s stronger than I am. 7. I feel eternally busy and for some reason it doesn’t feel like a bad thing right now. 8. Mantra: I have a lot to look forward to. 10. Friends can break your heart too.